I said I wouldn’t be one of those people who cooked for their dogs. And then we brought Riley home. He had a cough and choked on his hard food, so on Day 2 I found myself cooking up some brown rice, egg whites and cheese. I thought that would hold him over until I could get some softer dog food. Well, I didn’t stop there. New dogs require training, and training requires treats. Treats are expensive, so when I saw this post for DIY Dog Treats that uses only 4 ingredients, I thought I should try them. I had everything in-house and I already had the oven on! These are super-simple to make, and so cute too! I would have used a bone-shaped cookie cutter but I don’t have one so I used the heart. The Pretty One has been making fun of me since he saw them! As he says, just a day after I said I wouldn’t cook for a dog, I baked him treats. 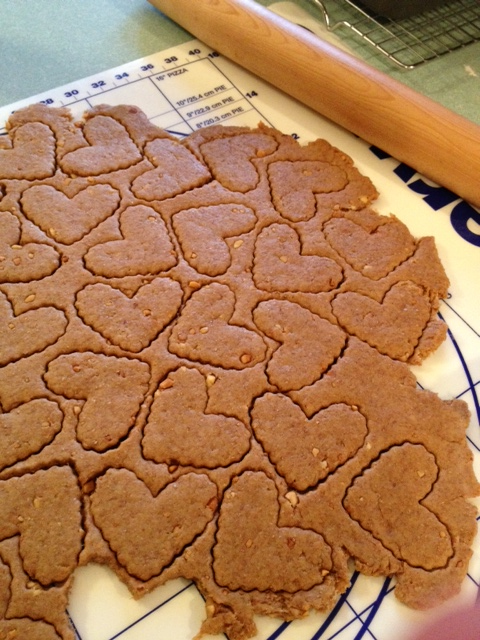 And not only did I bake him treats, but I cut them into little heart shapes! He’s taken great delight in showing them to his sister and his friends. I’m glad I’m here to amuse him. What are mothers for, right? Oh, and you should freeze whatever you don’t expect to use within a week. I checked the batch yesterday (2-3 weeks after I made them) and they’re growing fuzz. In a bowl, combine flour and baking powder. In another bowl, mix peanut butter and milk, then add to dry ingredients and mix well. Place dough on a lightly floured surface and knead. Roll dough to 1/4 inch thickness and use a cookie cutter to cut out shapes. Bake for 18-20 minutes on a greased baking sheet until lightly brown. Cool on a rack, then store in an airtight container. Make sure you keep an eye on them, because they tend to burn easily. Freeze whatever you won’t use within the week.